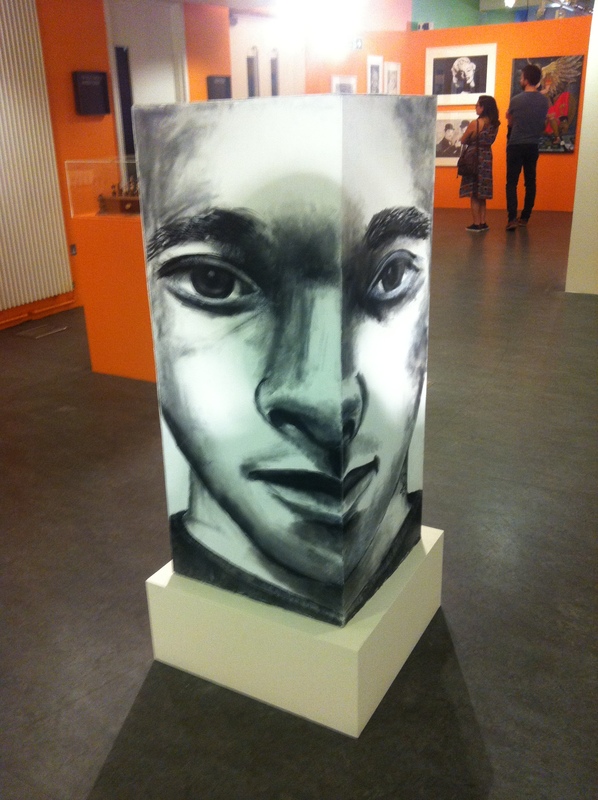 When I visited the Koestler Trust’s annual exhibition, The Strength and Vulnerability Bunker, in Autumn 2013, it was the first time I had thought seriously about offender art and its role in narratives of rehabilitation as well as wider questions of creative and prison labour. The 2014 exhibition also at Southbank left me with an overwhelming feeling of sadness – this was largely due to the incongruity between the two dominant narratives expressed by the artwork. On the one hand, there was a sharp political commentary present in many of the works and the juxtaposition of these brought to the foreground an awareness of the impact of Tory policies on those incarcerated or in secure units. The use of old prison library books in the work ‘Author’ by Stephen, HMP Peterborough seemed a particularly timely response to Chris Grayling’s decision to ban the delivery of books (along with other packages) to inmates in November 2013 (I wrote about this and the failure of mainstream media to pick up on the ban until Spring 2014 here and on Philip Davies’ subsequent claim in September 2014 that ‘prisons have better libraries than the public’ here). The pixelated portrait of Thatcher, ‘Iron Lady’ by Andrew, HMP Blantyre House provided a sobering follow up to his 2013 submission, ‘Sorrow’ featuring the grayscale, pixelated figure of man bent in prayer. Despite the title, ‘Sorrow’ seemed to me to provide a powerful response to the alienation produced by multiple forms of fragmentation commensurate with both a digital and carceral age. Conversely, the image of Thatcher rendered for a digital age, seemed to suggest a far bleaker world in which her legacy lives on in a more sinister, fragmented and, as a result of such fragmentation, pervasive manner. On the other hand, there were a number of portraits of famous stars notably Marilyn Monroe and Amy Winehouse. Given the theme of ‘Catching Dreams’, these seemed to contribute to a narrative, at odds with the biting political critique of other works, that of living vicariously through others but others whose fame and success was itself cut short by tragedy. Regardless of the personal motivations behind such portraits, or indeed the limited photographic images no doubt available to inmates as inspiration, framed within the exhibition’s theme, the representation of figures like Winehouse exuded an atmosphere of resignation, of thwarted dreams and a sense of futility. It was as if even the stars with whom the artists identified or took inspiration from, were destined to fail. In this respect, the message of the exhibition was one of ‘failed’ dreams rather than the possibilities opened up by the ability to dream. Which invites the larger question as to the role of the exhibition – does such resignation also attach itself to those viewing the artwork as it definitely did in my case? Does it reveal the cynicism with which offender art is touted as therapeutic, rehabilitative and ultimately emancipatory? Perhaps dreams need to be caught in order to keep them from taking on a life and meaning of their own. Caught and locked up before they can be realised. The ‘Break Out of Art’ picture by Kieron, HMP Whatton might be the key here, suggesting, intentionally or not, that art might be part of the problem in its framing and containment of individuals and public responses to the problems and difficulties of those being contained.